The Goodies the FInal Episodes DVD Review Rest assured the majority will still have your average ten year old rolling in the aisles. Indeed, the Goodies still are the closest any comedy team has ever come to creating a live-action Looney Tunes, and they deserve to be cherished for many years to come. The Goodies were an institution of 1970s comedy. A classic comedy trio who while sometimes simply labelled Monty Python for kids, Tim Brooke-Taylor, Bill Oddie and Graham Garden were hugely popular with audiences the world over for their manic plots, cartoon antics, and free-wheeling comedy style. No script was too outrageous for the Goodies; one episode might see the boys dressed as mice chasing down a giant kitten rampaging through London, and another learning the ancient Northern art of Eky-Thump, which involved merciless thrashings with black puddings. From the Loch Ness monster episode to the Sooty Rules O.K. episode, every kid who grew up in the 80s has their favourite, and remembers the Goodies with a warm and fuzzy sense of nostalgia. 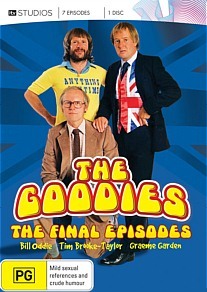 The Goodies had eight seasons with the BBC over the 70s. Now here for the first time we have their final 9th series, a 7 episode run with LWT. They include Snow White 2, Robot, Football Crazy, Big Foot, Change of Life, Holiday, and Animals are People Too. All seven were rarely seen after their initial airing. A network wanting a Goodies package nearly always bought the BBC’s 8 season faire, and so this LWT offering was left to gather dust. So why does this season even exist? The BBC must have figured the trio’s best years were behind them, and to an extent, they were right. However watching this final season there is still plenty of Goodies golden good-times. It’s not so much their shtick is no longer funny, it’s just they have already explored it in so many brilliant variations before. As even the Beatles knew, a good team can’t keep it up forever. For anyone new to the Goodies there still should be plenty of laughs, yet to long-time goodies fans it’s more like looking fondly on an ageing beauty queen – you love her for what she used to look like. Some episodes like Snow White 2 and Football Crazy are a little too British for international audiences to get, whereas others like Robot and Big Foot could have still fit well in any of their earlier seasons. Rest assured the majority will still have your average ten year old rolling in the aisles. Indeed, the Goodies still are the closest any comedy team has ever come to creating a live-action Looney Tunes, and they deserve to be cherished for many years to come.